On Saturday, 30th of June, EVE University had a meet-up of current and past members. All in all about 16 members and alumni joined in on the meet in London. Of those, four are part of our current directorate and two managers in EVE University. Our field reporter Laura Karpinski (also CEO) wrote up a little After Action Report with all the goings on. “Bates and I arrived in London in the early afternoon, checked into our hotel in the blazing heat and went off to look for the nearest pub to cool off. Which to those of a class level like ours means Wetherspoons. We grabbed some nice cold drinks and some food with Jilokari Kurvora and had a good catch up. After a while we were joined by Dunar Dolorgiet and we decided to head over to the meet-up venue at Hay’s Galleria. When we got there the venue was packed due to it being a World Cup match day. Jacob Velora had reserved some tables up on the balcony. There were lots of people I had met at previous meet-ups and some awesome people I had not met before as well. We stayed at Hay’s for a while, grabbing some food and chatting about spaceships and stuff closer to home. After a few hours some people had headed home and the rest of us wandered along the Thames to Old Thameside Inn, where we sat overlooking the river with some more drinks, enjoying the lights of London and the boats passing by. We want to thank all the attendees for making the time to come to this meet-up, and especially all the alumni who are still keeping in touch with our community. The next meet this year will be in the wonderful town of Leuven, Belgium, and is currently being planned, look forward to updates on that. 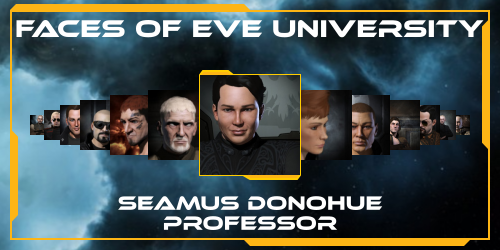 The Faces of EVE University are colorful and intriguing. With this interview series we want to bring to light some of the personalities that make up the staff of our alma mater, who tirelessly work to the advancement of learning. For this installment of our series we sat down to talk to our Director of Human Resources: Jilokari Kurvora. He enlightens us about how he became a director, what his work entails and how the departments he oversees work together. Hideo Date: For those who don’t know you, who are you and what do you do in New Eden and in EVE University in particular? Jilokari Kurvora: I am Jilokari Kurvora, Jilo to my friends (pronounced GeeLo). I’ve been alive since 8th November 2014, I am a Wormhole Dweller, and love to do solo exploration especially because I never know where I’ll end up. 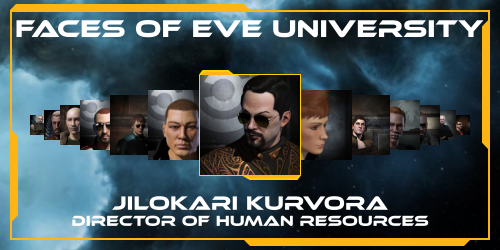 In EVE University I am the Director of Human Resources overseeing and setting policies for the the Recruitment, Orientation, Mentor, and Titles Departments. Hideo: How did you start off playing EVE and how did you become part of the Uni? Jilokari: Well I did try to get into EVE earlier, but my PC wasn’t really up to the challenge. I was always really inspired by the videos for EVE Online, the whole pioneer spirit of the game and I was especially drawn to the sandbox element. All those unscripted player generated actions and impacts fascinated me. So when I finally got myself a decent gaming PC in November 2014, I downloaded EVE online and chose a Caldari character (Who doesn’t love a bit of space capitalism). Off I went into the cold hard space only to get blown up in a ball of fire 3 jumps from the starter system. After a few days in game I came across EVE Uni, thought this is the place for me and never looked back. Hideo: Could you tell us a bit about how you managed to climb the ranks to the heights of Director of HR? Jilokari: I’m a highly qualified assassin and I got better shoes out of it. But seriously, since you asked nicely Hideo, I actually started off my EVE Career by becoming a Personnel Officer. I mainly did it because I was fascinated on the inner workings of Corporations in EVE, specifically how they reflected real life, just with more spreadsheets. From there I became a Senior Personnel Officer, I’m told in the fastest time ever for a promotion, so I must have done something right. A few months passed and the opportunity arose for me to move into Personnel Management. First as Assistant Manager then Personnel Manager, which I thoroughly enjoyed because my PO’s and SPO’s are awesome guys and gals. In 2018 I was honored to be asked to become Director of Personnel, a role which I only held for a few months before stepping into Director of HR when our last Director of HR, Dune Barphsaq, stepped down. Hideo: So as you are newly inducted into the role of HR Director you must have a pretty fresh view on things. Could you give us a glimpse into your daily workload? Jilokari: Well at the moment it’s quite busy, as Director of Personnel I had two departments under me, Personnel and Orientation. At the moment I haven’t backfilled the Managers in those departments so I’m doing the daily manager tasks, such as monitoring the queue levels, answering questions of officers and members, and keeping the departments records up to date. I also check into all the slacks to see what the conversation is across the Uni and try to keep up to date. You can also usually find me trawling through the forum, keeping up to date on developments there. In addition to that I’m getting to know my other departments, Titles and Mentors, reviewing feedback and looking for ways that we can make the service we offer better for our members. Hideo: Your Directorate in particular seems to have a lot of varied departments under it, how does it all fit together in your mind? Jilokari: A great question! I think the simplest way to look at it is my Directorate inducts, orientates, supports, and marks progression of Members in the University. We are the first people they interact with when joining and a constant presence as they progress. Hideo: How is the relationship between the departments? Jilokari: It’s all about the relationship for me! I’m a massive people person, and I think that some of our best work gets done when we all work together as a single unit. Each of my departments impacts on the other in some way, whether that be Personnel creating work for Orientation, Orientation driving titles or mentor applications, it’s all interconnected. Do I think we have it nailed just yet? No, but I do know that the folks of the HR directorate are awesome and we have begun to make small changes to improve communication between the departments, which can only serve to improve the members experience. Hideo: How do you keep track of the different departments? Hideo: How did you handle the change over from Manager to Director? I assume the time you need to put in now is much increased? Jilokari: There is certainly a lot more to be aware of, and an increased sense of responsibility. I’ve definitely seen an increase in the amount of time I spend looking through the forum, discussions on slack, actions like removing inactive members, and applying in game titles etc. It can sometimes feel like a second job, but I wouldn’t change it for the world! One of the more interesting things for me is trying to become more visible to members. Gone are the days when I could just not log on for a few days because I felt like it, or stick purely to exploration. As a Director I think there is an expectation from our members that I be seen participating, which is great, but just as an advanced warning to our members and FC’s: beware my PvP foo is not strong. Hideo: You’ve already made a few internal changes as well as introduce a significant change to the titles within EVE Uni. You also were quite busy with the recent introduction of the new EVE Uni Portal. Would you care to elaborate on what has happened so far during your tenure? Jilokari: Oh I think you pretty much covered it there. We are still in the process of rolling out our new University Portal which is looking awesome and will make life so much easier. I stepped into the role fresh off the back of the Uni wide survey, and it was clear that there were areas that our members felt we could evolve and I agreed! I’d say the biggest changes were allowing alpha clones to apply for the Freshman progression title, and allowing members who returned to the Uni or swapped their character to transfer any progression title they held over. We have lots of good ideas on where we can take the HR Departments in the future so watch this space. Hideo: Is there pressure from students, prospective members, or upper management to shift the bureaucratic nature of EVE Uni’s recruitment either way? If so, how do you balance your own goals and vision for the department with those outside perspectives? Jilokari: Internally I don’t see there being any pressure really, we can get a bad rep externally sometimes though. I think EVE Uni’s recruitment process is a bit like marmite. (the food – if you can even call it that, not the alliance) Some people love it, some people hate it. Ultimately it is there to ensure that someone is right for us and we are right for them. When I first joined the Uni it was almost a 2 week wait, now on average it takes 4 days from application to accept for an applicant with an average wait time of 4 hours in our queue. Do I think we can improve on the process? Sure and it’s something that I will be looking at closely. I’d also point out that while people are waiting to join they can still take advantage of our Wiki, and our classes which are both publicly available. Hideo: The introduction of officers dedicated to orientation is a relatively recent addition to HR. Has the program been as successful as management hoped? Hideo: How do you personally see the importance of mentors for the experience new players in EVE University get? Jilokari: Oh I think mentors are really important for newer players. EVE is such a complex and varied game, I regularly come across applicants who want to learn everything. Mentors can help hone their knowledge and help them get more out of this wonderful game. I think that Mentors contribute highly to people sticking around and not getting burnt out or frustrated. I wish we had more Mentors. Hideo: What would you say is the biggest hurdle EVE University, and your directorate in particular, will have to overcome in the next year? Jilokari: Honestly, the biggest hurdle for the HR Directorate is staffing. We have some amazing people who do great work but people move on, find other interests which means we are always recruiting. I am passionate about keeping our wait times for interview and titles low, as well as having mentors to spare. I also want the HR Staff to actually enjoy EVE and not have to spend all their time doing space admin, so yeah, we need to keep a good flow of new staff. Hideo: Well that’s it for my questions so far. Do you have anything else you want to talk about or any closing statements? Jilokari: Thank you for the opportunity to discuss the HR Directorate, I would say that my door is always open so if anyone needs or want to raise anything about the HR Directorate they can contact me wether in Slack or via forum message. On May 5th, we had a very special event on our public mumble. Guest speakers Marrowbone and Tovanis from Broadcast4Reps gave a short introduction to what Spam4Heals and B4R are all about. They afterwards took the time to do a very in-depth Q&A and answered questions from the live audience both from our lecture channel as well as mumble. Broadcast4Reps was founded in the wake of John Bellicose – from BRAVE – committing suicide. This spurred the development of a suicide prevention group inside of BRAVE. The founder of Broadcast4Reps, Coffee Rocks, reached out to CCP to work together. They created a video that describes what B4R is about – a peer-to-peer initiative to provide mental health support, especially to people thinking about suicide – and urging players to reach out, whenever they need help. Spam4Heals is a registered charity in the USA, which sprang from the Broadcast4Reps movement and Marrowbone is the current CEO. They are looking to expand their work into other games as well and are interested in contacts in gaming communities outside of EVE. There will be a new website up, hopefully at the end of the month, which Marrowbone is particularly excited about. Other than that, the Facebook page will be overhauled and include a calendar with all events pertaining to Broadcast4Reps. B4R are also looking to do a public outreach to all corporations within EVE, so that players from every walk of life know where to find help. Of course without the many volunteers on Discord as well as the ingame channel, this service would not exist, and Marrowbone made sure to especially thank all those who are helping out. Broadcast4Reps is always looking for more volunteers! If you are in need, reach out! If you ever need help, reach out to your fellow EVE players! Use #B4R on Twitter, join the ingame channel Broadcast4Reps and the Spam4Heals Discord. In both the channel as well as on Discord you will find volunteers and fellow gamers who are there to help you, when you are in need. We want to especially thank our Events Manager Turlough Dominian for setting up the contact with B4R and organising this wonderful event! We hope to work together with Broadcast4Reps in the future. As part of the EVE University faculty he is also known for his encyclopedic knowledge. Every week he hosts a game mechanics Q&A on our public mumble and answers questions about any topic pertaining to EVE. Six years ago he started his first iteration of “How to survive EVE Online” and since then he has made countless videos about a huge range of topics. Always focused on clear and concise information understandable by even the most inexperienced EVE player. Hideo Date: Thank you very much for taking the time, it is much appreciated! Seamus Donohue: Not a problem! Glad to be here! Hideo: For those who don’t know you, who are you and what do you do in EVE in general and in EVE University in particular? Hideo: Was that the only push you needed to start up your signature series? Did you just always want to make videos on EVE? Seamus: That was the push, yes. Back in 2011, some fellow Unistas were starting to play Minecraft (which was new at the time), so I was starting to look into whether or not I wanted to buy the game. At the time, minecraft.net had Paul Soarez Junior’s videos linked on their page, and after watching the 23 episodes that existed at the time, I decided “Yes, I want to play Minecraft!” I’ve been playing that off and on ever since. But almost immediately afterwards, it got the idea into my head that I could make a similar series for EVE Online. Hideo: That is wonderful! Now that you redone your original series and updated it for 2018, what are your plans moving forward? Hideo: You are not only known for your videos, but as you stated earlier you are also part of our faculty, how did you become a teacher in EVE University originally? Seamus: Let me think. [pause] I started the game early September 2009, during Apocrypha, and first joined E-UNI just before the end of that same month. I think I joined the faculty in 2010. Around that time, I had been acting as a defensive scout/picket for E-UNI daytripping fleets in wormhole space, scanning down sites to run and being on the lookout for other players who might try to ambush us. After some small number of months doing that, I created (and started teaching) a “Scouting in Wormhole Space” class, based on my experiences. When I started actually teaching that first session is when I was surprise-inducted into the Education Department by Deirdre Vaal, then Director of Education. I’ve been a member of the department ever since. I was actually surprised to learn, recently, that I’ve been with E-UNI for 60% of it’s history. Hideo: It seems that you build your vast knowledge very much from personal, hands-on experience. Is that the case for all of it? Especially with regards to your Q&A session where you answer questions about any and all topics. The rest is stuff I’ve learned from other Unistas secondhand, for the most part. I’ve only very rarely been in player-sovereign space, and never involved in sovereignty battles, for example. I don’t usually go on PvP roams, though I’ve been on a couple of Dragonslayer operations and a wormhole POS bash. Things like that. Hideo: Alright. What do you find interesting or appealing about doing your Q&A sessions? Seamus: When I started the sessions, it was just a formalized form of what I had already been doing in the Mumble: answering questions that sometimes come up. So, it was a natural extension of my existing EVE Online activity. Hideo: So I am sure you are constantly giving players much appreciated information and advice. But I am going to put you on the spot: If you could give new players one piece of advice, what would it be? Experiment around a little bit, see what you like doing in-game. Then find a group of like-minded players that you can get along with and (very importantly) trust. Hideo: Except your teaching experience and your video making, are there any other projects you are currently, or have ever been, involved in with regards to EVE? Seamus: The only one I can think of was that I once taught an E-UNI class as a FanFest presentation. “A Study of Geometry in EVE Online” I had originally titled it “The Shape of Things That Are”, the joke being that Fanfest was about seeing the shape of things to come. Other than that, I can’t think of anything off the top of my head. Hideo: Last question, looking at recent events: you actually attended Fanfest together with a delegation of other Unistas this year. I heard quite a few great remarks about your singing at both the karaoke night as well as the wedding ceremony for Irma and Tairon [Editor’s note: here is is a time-stamp on a video where you can actually hear Seamus sing: https://www.youtube.com/watch?time_continue=823&v=XM7If2z6kQo]. I am curious: do you have any formal training or experience in singing? Seamus: Experience in singing, yes. “Formal training” depends on how you want to define that. I’m a member of a church choir in Real Life™, and we’re very lucky to have as our choirmaster someone who /also/ works as a professional operatic voice coach. He teaches professional opera singers how to sing. He once told me that I’m what is known as a “serious amateur”. Hideo: Alright. Then thank you very much for your time. And continue to be the great asset, that you are to the Uni! Seamus: You’re welcome, and thank you for your effort in organizing and conducting these interviews! This year’s Fanfest was a special one: it was the 15th anniversary of EVE Online and full of amazing announcements! Ranging from quality of life improvements to PI, to a completely new kind of space, with a new faction, ships, as well as weapons. In the midst of it all were a number of our Unistas. Some of them (Knicpaw and Titus Tallang) even active as official volunteers to make the whole affair smooth sailing. My first Fanfest was awesome from start to finish, and it seems unfair to single out one thing as the best. The various presentations and roundtables were great, but CCP Games Games was as unexpected as it was hilarious, starting out as a cheesy 70’s quizshow and ending up as a Japanese crazyshow. The Party At The Top Of The World with Permaband and Basshunter was a perfect end to it all, with crazy EVE’rs both on stage and on the dancefloor. However, the thing that truly made Fanfest shine for me was the people. I loved meeting up and hanging out with fellow unistas, as well as having discussions about the weirdest of topics, be it with goons, pirates, industrialists or whoever. It was hard not being a bit starstruck when meeting well-know CCP’ers and major players in the game, and where else can you suddenly discover that the guy you’re chatting with over breakfast is the same guy whose blog you’ve been reading for 3 years? So, Fanfest – come for the events, but stay for the people, that’ll have to be my biggest takeaway from it all! 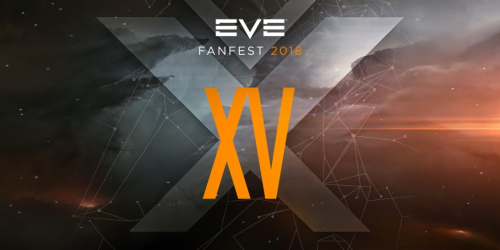 The most memorable event of Fanfest 2018 for me was getting to participate in the Streamfleet roundtable with CCP Guard and the streamers who literally introduced me to the EVE universe and to EVE University. It gave me a chance to say “thank you” to just a few of the people who work so hard to promote the game. “What is my most memorable event of FF 2018?” It may be cliche to say, but it was VERY MUCH the people. I was also lucky this year that I got to see the event from the point of view of a Volunteer; I was able to meet almost everyone during check-in, and was available to help those who had questions. Everyone was excited and friendly, and willing to interact with those outside their own group/circle because we have SO MUCH in common (aka Internet Spaceships). Players were “Jove”-vial (pun), telling stories about their best (and most embarrassing) moments, and poking fun at each other while accepting all styles of gameplay. Also, there was A LOT of attempted recruitment. Personally, I enjoyed the roundtables and player speeches/panels; I learned SO MUCH about ESI and 3rd-Party applications that I think I will forge into that arena with my own app (eventually, as there is a bit of a learning “cliff”). Reykjavik and Iceland are BEAUTIFUL, and the people are friendly with almost no language barrier. It is the perfect destination for a vacation, and for those who have a spouse/partner, there is plenty for them to do while we capsuleers are nerding-out. This was my 2nd FF; I knew after my 1st that I wanted to return. I still feel that way; and although there won’t be a 2019 FF, I am eagerly awaiting FF 2020 tickets to go on sale. As far as arranged events, the standout ones for me were Elise Randolph and Hedliner’s talk on ‘A History of Fleet Commanders’ – which was one of those things like the ‘This is EVE’ video that just make you go “Wow – I remember why I love this game”, and the CCP Games Games, which had me in stitches. But it was also wonderful to meet up with some of the lovely people I met at last year’s Fanfest and also meet some new people, who I hope to see again at the next one. Thank you for an amazing Fanfest 2018! We would like to express our sincerest gratitude to our attendees for holding up the flag of EVE University at Fanfest 2018 and of course to CCP and everyone who made this wonderful event possible! Next year will have no traditional Fanfest, but you can count on our members showing up at meet-ups all over the world! 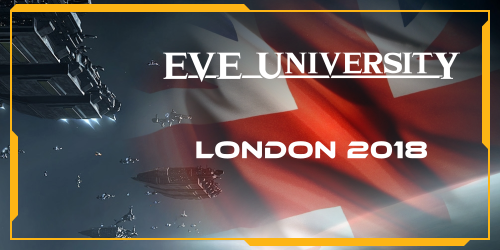 We will actually have an EVE University meet of our own in London on June 30th this year, so you can look forward to hearing more about that in the near future. 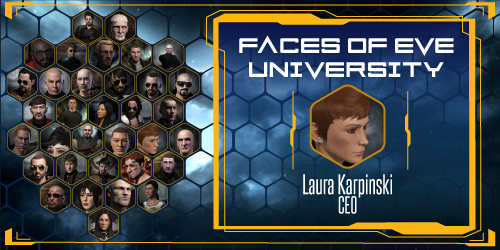 For our second interview we had the chance to talk with the current CEO of EVE University: Laura Karpinski. She has been CEO for about one year now and gives us an amazing insight into the inner workings of the organisation. She also shares some personal experiences and talks about how she ended up in her leadership role. Hideo Date: So first off, thank you very much for taking the time to sit down and talk for a bit! Laura Karpinski: That’s quite alright. Hideo: For those who do not know you, could you tell us quickly who you are and what you do in EVE? Laura: Sure. I’m the CEO of EVE University, which means I set the overall direction for the corporation and try and keep everyone going in that direction. I have a team of Directors who each look after their particular area of the corporation, and I keep in touch with all of them and make sure we are all on the same page. Hideo: How did you find your way into EVE and then into the Uni? Laura: My RL ex-boyfriend introduced me to the game. I wasn’t convinced it was the kind of thing I’d enjoy but I figured I’d give it a go. Six years later I’m still here. I joined EVE University because I was overwhelmed by the amount of information and the complexity of the game and I thought it would help me find my feet. Hideo: So you stumbled into the game like every other player as well, that is kind of comforting. And now you are the CEO of EVE University. How did you end up taking this job? Laura: I was Director of Operations to the previous CEO Azmodeus Valar for a year before I became CEO. That enabled me to learn the ropes under Azmo’s guidance. It meant that when Azmo decided to step down as CEO I was in a position to step into his shoes. Hideo: To elaborate on that: What prompted you to take on a leadership role in the Uni in the first place? Laura: Well it wasn’t what I set out to do. I joined EVE University twice. The first time I didn’t really engage with the community and didn’t learn very much. So the second time around I resolved to do things differently and to get involved as much as I could. That prompted me to apply to first join the staff as a personnel officer. I absolutely loved doing the work and as people moved on I was happy to take on more responsibility. So I became a senior personnel officer, assistant personnel manager, personnel manager, personnel director and ultimately director of human resources before moving to director of operations and then CEO. Hideo: Looks like a nice career path to follow for aspiring members! Hideo: Let’s move on to the corporation it self. You kind of answered this in shorthand already, but maybe you want to elaborate: Could you give us a short overview of the structure and procedures in EVE University? And what is the focus of your daily work? A glimpse into the inner workings of the Uni so to speak. Laura: Sure. So we have 9 Directors who are each responsible for their own area, for example education, logistics, human resources. Most have several departments or campuses that report to them, each headed by a manager. Of those, most departments and campuses also have staff who carry out the day to day work. What that means from a member’s point of view is that we can offer classes, mentors, hangars, ship replacement etc. For me, my daily work mostly involves reading things. I try and keep an eye on all our Slack channels, chat channels and what is going on on the forum. I am the ultimate lurker, I like to know what is happening. Then a lot of my job is talking to people, either planning for the future with directors or trying to help resolve or prevent problems. There is always a lot of discussion going on behind the scenes, behind every change or decision. Hideo: Ok, so as you have experience with this on all levels I would also like to ask you about one specific area: How does the recruitment process of the Uni work? And what do you look for in applicants? Laura: Applicants put in an application to join. Like most other corps, this involves them giving us an API and filling out an application. We then have a two stage review process. Every application is given an initial review by one of our personnel officers, who may decide in some cases to accept them based on the application. If the personnel officer feels it would be beneficial to ask the applicant some more questions, they will place them in a queue for an interview. When the applicant gets to the top of the interview queue, they will speak to a personnel officer, who will then decide based on the interview whether to accept or reject the application. We accept the majority of applications, provided we don’t think the applicant is intending to do us harm, and provided they will fit into the community and benefit from being a member. Hideo: So just as an aside: I happen to know about rumors that you are still in there and doing interviews yourself. Are you even now trying to get up your stats? Do you care to comment? Laura: Haha they can’t keep me away from doing interviews, I love it too much. Hideo: That is good to hear! Hideo: Onto the next topic: What do you personally find appealing about a corporation focused solely on learning and teaching? Laura: EVE is a complex game, no way about it. CCP are improving the new player experience but its still super overwhelming for new players to join in this massive universe where everyone seems to know everything. EVE University is one little oasis where new players can admit they don’t know stuff, and can learn it in an environment where people are not trying to screw them over, until they are ready to move on. I really like that. Hideo: How do you see EVE University in relation to other learning corps? Is there a sense of competition, or more of coexistence? Laura: Its an interesting development. When EVE University was first established 14 years ago there were not a lot of other corps teaching people to play the game. That has now changed completely, especially since the introduction of alpha clones. A lot of null sec blocs have their own teaching corp, which is great because it really brings the focus on new players and helping people get into the game. EVE University has always aimed to be neutral, for the reason that we want our graduates to have the widest choice of corporations to move on to when they leave us. So in that sense we offer something different from a lot of other teaching corps – a place to learn without pinning your colours too soon. So there’s not really a sense of competition for us. If a new player wants to live in sov null immediately we are not the best place for them, and we are happy to tell them that. Hideo: What do you think are essential hallmarks for a successful learning corporation? Laura: Every person learns differently, so I guess it is pretty subjective. I find EVE University tends to attract people who like to read up on things before doing them (our wiki is often the first way people hear about us), and who like to find their feet before they pick a side. But other teaching corps pride themselves on diving in, throwing caution to the wind and sometimes making mistakes, and have been very successful. That’s also absolutely fine. I don’t think there’s any one particular answer. Hideo: Ok, so to wrap up: With the recent 14th anniversary of the Uni also marking your own first anniversary as CEO of our organisation, how do you look back at your term so far? What are the most important developments in the last year? Laura: I’ve had a great time as CEO. I love the corp, I love the people and I love the game. My first year as CEO has involved a lot of learning, and lots of smaller changes to standardise things, or improve how they are done. There have been a few bigger changes as well. The Street Team is a great example – EVE University has recently had a fairly lowkey social media presence but the Street Team are really turning that around, getting out there and telling people about who we are and what we do. Another big change for us has been the trial of altered rules for attacking and defending structures, which has allowed our members to explore different areas of the game. The trial is still going on at the moment and we’re keeping an eye on how things go. Hideo: Well, thank you very much for that encouragement, I think the whole team will be very pleased to read this! Lastly: Did you have any particular challenges to overcome as CEO? Laura: I’m a bit shy and not too confident with speaking to large groups of people, so the first few times I held a management meeting or one of our Ask the Management Q&As were a bit nerve-wracking. I’ve done enough of them that I’m much more comfortable with it now, though. Hideo: So do you have any closing statement to conclude our interview? Laura: Nothing aside from thanks for taking the time to do these interviews, it’s a great chance for people to look behind the curtain and get to know the people who keep this corporation running. Hideo: Well, thank you very much for taking the time to answer all my questions so openly! Today not only marks the day of the 14th anniversary of EVE University, but also Laura’s first anniversary as CEO. We are grateful for the enormous amount of time, effort and love she, and the rest of our staff, puts into EVE University every day and we would like to thank everyone that put together such a great anniversary event!